Dead Stars is one of those bands for whom you naturally root. They make excellent music that lacks any posing or pretentiousness, they are superb musicians, and the trio are generally all around good guys. This is the kind of band that you want to hang out with after the show. And thankfully we’ve been able to do that twice, last October at our annual CMJ Day Party at Cake Shop and earlier this month at a show we presented at Cameo Gallery. In the interim months between these two shows, Dead Stars signed with Old Flame Records who will release their new album Slumber, due out on June 17. The recordings of these two shows feature what amounts to most of the new album in a live format. Speaking of which, Dead Stars will play the CD release show for Slumber at Union Pool on June 19. Thereafter, the band heads out on a two week tour through the East coast and Midwest. I recorded the Cameo show with the Sennheisers mounted high in front of the soundboard and mixed with a fine feed. The Cake Shop show was recorded with the Sennheisers mounted on the low ceiling in front of the stage and again mixed with a board feed. Cameo is deeper and richer sounding, but has some boominess, while Cake Shop is very upfront but perhaps a little thinner than Cameo. Both are excellent recordings in their own right. Enjoy! 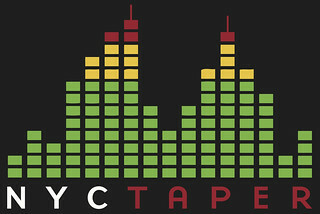 If you download these recordings from NYCTaper, PLEASE SUPPORT Dead Stars, visit their Facebook page, and Pre-Order Slumber from their Bandcamp page or from Old Flame Records [HERE].